Music can transport us back to a time and place faster than any other art form. That's the premise behind Billings, Montana native Robert K. Elder's newest project, "The Mixtape of My Life" -- a journal that helps people write their autobiography through their music collection. To celebrate the new book, Elder and his illustrator Rob Marvin are holding a book release party on Thursday, July 26th from 6-8pm at The Pub Station in downtown Billings. Both Robs are partnering with us here at Waste Division to give local writers an opportunity to produce essays about how music has impacted their lives, and a chance for these essays to be published and read live at the event. Cash prizes also available! You are invited to submit a piece of writing about an important piece of music during an important time in your life. Essays must be no more than 500 words. Is there an artist or song you can't listen to because of a past relationship? Was there any music forbidden in your home? What was it, why was it banned, and how did you listen to it anyway? Who would you like to sing the story of your life? List some titles for this biographical album. The top three winners will receive the opportunity to read their essay live at The Pub Station in downtown Billings on July 26th, 2018 at the book release event. Authors will also have their writing published on the Waste Division website and circulated around our social media platforms. Winners must be able to attend the book release event to read their work. The top essayist will be published on Waste Division, read their essay live at The Pub Station, and also receive $100 in cash, a $50 Pub Station gift card, and a Waste Division swag bundle. The two runners up will also be published on Waste Division, read their essays live at The Pub Station, and each receive $50 in cash, date night movie vouchers to Art House Cinema & Pub, and a Waste Division swag bundle. Two honorable mentions will be chosen to have their essays published on Waste Division and also receive a Waste Division swag bundle. Contest Deadline: Our contest is now closed for submissions. Thanks you to everyone who took time to submit! ROBERT K. ELDER (@robertkelder) is a tech and media executive in Chicago, and the author or editor of eight books. He is a native of Billings, Montana, and graduated from Billings Senior High School (Go Broncs!). He work has appeared in the New York Times, Chicago Tribune, Los Angeles Times, Paris Review, and many other publications. This book was started on a road trip to Terre Haute, Indiana, and completed on a road trip on the Blue Ridge Parkway, written on the back of tray liners from Krispy Kreme donuts. (Thanks to the employees of Krispy Kreme in Blowing Rock, North Carolina—coincidentally the hometown of author Tom Robbins.) . 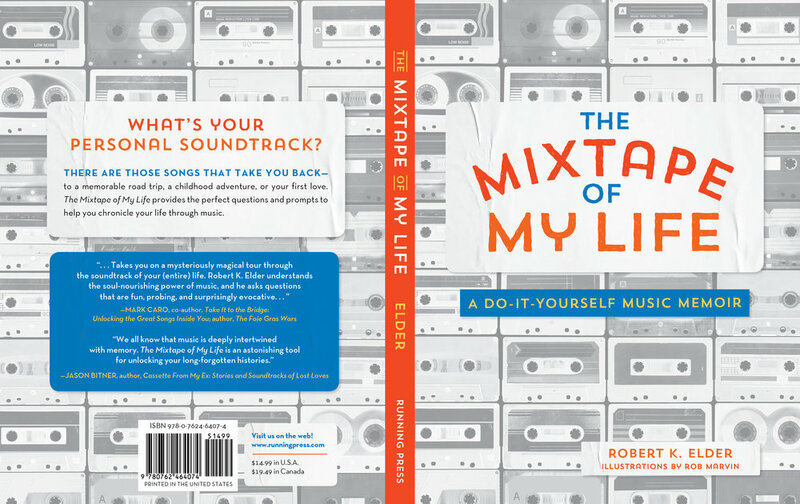 Visit www.robertkelder.com for more information and share your stories at www.mixtapeofmylife.com or via Twitter using @mixtapemylife. Also, a special thanks to our friend and talented writer Anna Paige for all of her help!